So your first burning question is likely to be “Where is UB7?” if you haven’t already exclaimed “But that’s not London!” To get the latter issue out of the way, it’s been part of Greater London since 1965,1 falling within the London Borough of Hillingdon (before that it was in Middlesex, as it still is to the Post Office 2). To cover all the different areas that could be considered (and have historically been considered) to make up London would take a longer post than anyone would wish to read, but for my purposes, an area being geographically located within Greater London makes it London. Figure 92. 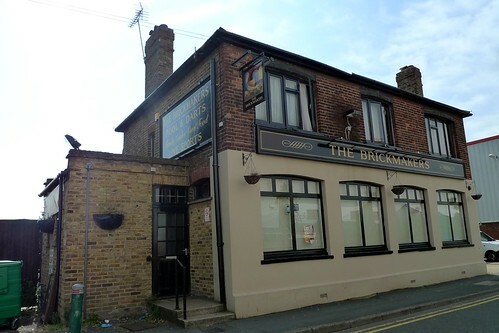 The Brickmakers (Yiewsley UB7). Until the mid-20th century, Yiewsley was a centre for brickmaking, with the brickfields employing a sizable number of local labourers. The pub pictured here (The Brickmakers, formerly The Brickmakers’ Arms, fig. 92) is one of the sole remaining hints at this manufacturing past, which at a commercial scale goes back to the 19th century, though there are indications it may have started as early as the 15th century.5 Industrial units still dominate the eastern stretch of Yiewsley along the Grand Union Canal and then for several miles more through adjoining Hayes — including the curious and very recent little enclave of Stockley Park (with its own postcode and its own Wetherspoon’s)6 — but most of the pubs which once served this thirsty population (The Dawley Arms, The Rising Sun and The Foresters’ Arms) have since disappeared. A much older settlement lying to the south of the railway line, West Drayton village was historically an agrarian community focused around The Green, a verdant rectangle of grass with roads and homes on its edge dating back as far as the 16th century (though the settlement can trace its roots for several centuries before this). None of the taverns on The Green itself are still going (The Swan was rebuilt in the 1960s and only recently demolished), though The King’s Head building is still there, little altered it seems, and blending in seamlessly as a residential property (which is quite often what pubs were in the past, i.e. houses that were open to the public). Figure 93. 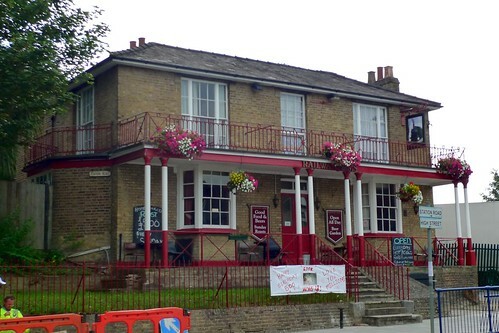 The Railway Arms (West Drayton UB7). Development extended to the north of The Green with the opening of the canal (by 1800) and then the railway station (in 1838), meaning that The Railway Arms (fig. 93) is the oldest remaining pub.7 Over recent years it appears to have gone through a patchy period, closing and opening several times, but it’s an attractive building with its balcony and large upstairs windows. Further residential development to the south and east in recent decades has also included a flat-roofed estate pub The Cat and Fiddle!, still clinging on with the addition of a jaunty exclamation mark, while a much older pub overlooking Fray’s River (The Angler’s Retreat) has recently closed, presumably finding that neither angling enthusiasts nor the adjoining caravan park (itself carefully tucked out of sight) have contributed sufficiently to its survival. These two villages, lying a mile apart and connected by Harmondsworth Lane, have their own extensive history, with the former dating back as far as West Drayton if not earlier, though both have remained very much sleepy and village-like at their cores (despite the larger modern commercial developments at their fringes). I know Harmondsworth’s name from the address listed on the colophon page of many Penguin Classics books I read when I was younger (though Penguin Books has since left the area). To most, though, if they know it at all, Harmondsworth is famed especially for its Tithe Barn, one of the largest of its type remaining in the country, a timber-framed construction built in 1427 by the manor’s then-owner Winchester College. The church of St Mary’s is even older, and I wouldn’t be surprised if its inns dated back as far, though records do not reveal precisely when these were established (as records rarely do when it comes to pubs). Figure 94. 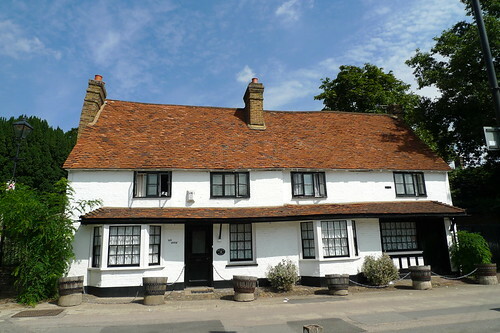 The Sun Inn (Harmondsworth UB7), now closed. Crossing the A4 from Harmondsworth and heading south-west past the Colnbrook Bypass, we come to the last stop on our tour, the village of Longford. The Bypass prompted a lot of development when it was constructed in 1929 (not the least of which was a prominent and quite recently-demolished pub at its intersection with the old Bath Road, The Peggy Bedford10), but in some ways it helped to protect Longford from too many changes and preserve its villagey feel. Even Heathrow seems a distant and shadowy presence, until that is an airplane taking off a few hundred metres away shatters the tranquillity — which only happens every few minutes. 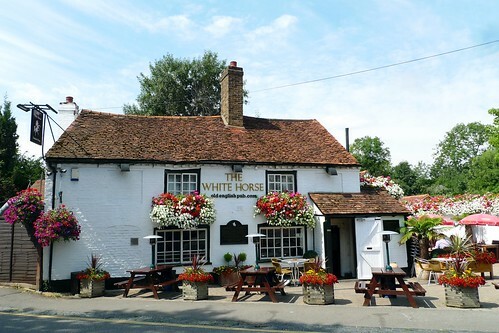 The lunchtime table of office workers from nearby British Airways headquarters toasting a colleague on her imminent departure for a new job also suggested the character of the area when I visited the area’s oldest remaining pub, The White Horse (fig. 91), which nestles only a few metres away from the more reserved presence of The King’s Arms. Both are situated on the Bath Road, which for just this mile or so is a quiet village high street, thanks in part to that Bypass as well as to a fortuitous curve in the road, shielding the village centre from the world beyond, where Bath Road soon swoops over the M25. It is, in short, a fascinating area where the sylvan pleasures of a pastoral existence constantly rub up against the frightening monolithic conformity of modern development, even if it never seems quite as existentially bleak as in, say, the novels of JG Ballard. The drinking establishments reflect this too, as the number of preserved pubs of the past contend with an increasing number of modern redevelopments and vacuous hotel bars with their particularly transient guests. Current government policy has preserved some of this for another few years at least, but who knows what further changes might be in store. For a full list of current and former pubs in the UB7 postal district, see the London Pubology site. As ever, refer to Wikipedia for more information about the administrative reorganisation of the area around London under the Local Government Act 1963 (Wikipedia link), which took effect on 1 April 1965. The postal counties were discontinued officially in 1996 (Wikipedia link), but are still optional and occasionally crop up. To recap, Middlesex no longer exists in any meaningful way. There’s a long article over at Wikipedia detailing the proposals. One wonders what the effect on the area would be if the airport were entirely relocated elsewhere in the country (as some alternative proposals suggested, the most reported — perhaps because the most extreme — being ‘Boris Island’ in the Thames Estuary). However, from a realistic point of view it seems unlikely that total relocation will ever happen. When built this was called the Grand Junction Canal. It was given assent for construction in 1793 and was fully open by 1800 (Wikipedia entry). According to Susan Reynolds (ed. ), A History of the County of Middlesex, volume 3 (1962, accessed online, British History Online link), there was an area called ‘Brick-field’ in West Drayton in the 16th century. The last of the brickmakers left in 1935 as the resources were used up, and the industry was extended to sand and gravel extraction from this point onwards. It was built in the late-1980s (so, at the same time as the Docklands were rather more famously being retrofitted for late capitalism) and is a sort of airless West London model workers’ community albeit at a smaller and more appropriately boutique scale: well-kept open space, an upmarket golf course, a shopping centre by an artificial lake, many many office blocks and roads along which very few people are permitted to drive. Refer to “Stockley Park” in Russ Willey, Chambers London Gazetteer (Edinburgh: Chambers Harrap, 2006). Incidentally, that postcode is UB11, and of course London Pubology has (a brief) a page for it. The West London Pub Guide, 2nd ed. (St Albans: CAMRA, 2005) states it was built in 1820, though this is 18 years before the arrival of the railway, so either it had a different name when it opened, or CAMRA’s information is incorrect. T. F. T. Baker, J. S. Cockburn and R. B. Pugh (eds. ), A History of the County of Middlesex, volume 4 (1971, accessed online, British History Online link). While I’m talking about Sipson, I should mention in passing The Three Magpies (TW6), which though it is in a different postcode district, still falls under this area historically and has just as much history as the pubs above, even if it now feels overwhelmed by the thundering passage of the Bath Road out the front and the airplanes behind. Prior to being named after her, this pub was called The King’s Head, and naturally had quite a long history in the area, the last century of which was under the proprietorship of the Bedford family. One can only imagine the force of personality Mrs Bedford must have wielded in the locality to have had the pub take her name. This entry was posted in Pubs by Area and tagged harmondsworth, heathrow airport, london borough of hillingdon, longford, outer london, pubs by area, sipson, ub7, west drayton, yiewsley. Bookmark the permalink. Lovely old pub, amazing picture in the summer.